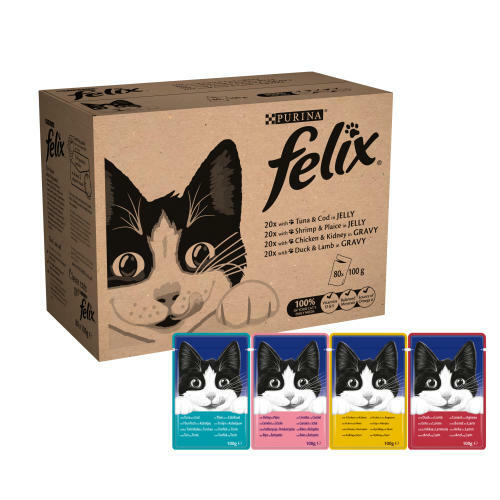 FELIX is made with quality ingredients and packed with meaty and fishy pieces in a succulent jelly so your cat enjoys an irresistible meal every time. That’s not all! Each recipe is a source of essential Omega 6 fatty acids and has the right combination of balanced minerals and vitamins to satisfy 100% of your cat’s daily needs. Individually foil sealed to keep in the taste cats love, each pouch is a perfect balance of delicious flavour & convenience; just snip it open, pour out the succulent chunks smothered in jelly, & let your cat become a Felix cat! Fish and fish derivatives (Tuna 4%, Cod 4%, Shrimp 4%, Plaice 4% ) or Meat and animal derivatives (Duck 4%, Lamb 4%, Chicken 4%, Kidney 4%) , Minerals, Various sugars. Vitamin A: 1490, Vitamin D3: 230, Vitamin E: 17, mg/kg:, Fe (E1): 10, I (E2): 0.3, Cu (E4): 0.9, Mn (E5): 2.0, Zn (E6): 10.